Adorned with our Flora pattern, this large coupe serving bowl is a wonderful addition to any table or buffet and also makes for a special gift for the sea lover in your life. Generous in size, and graceful in form, this soft, botanical-patterned bowl will become a house favorite. Vintage engravings are printed in soft gray and blue tones. Hand-decorated. Made in America exclusively for Nourish™. Measuring 13.5 inches in diameter and 2.75 inches in height. 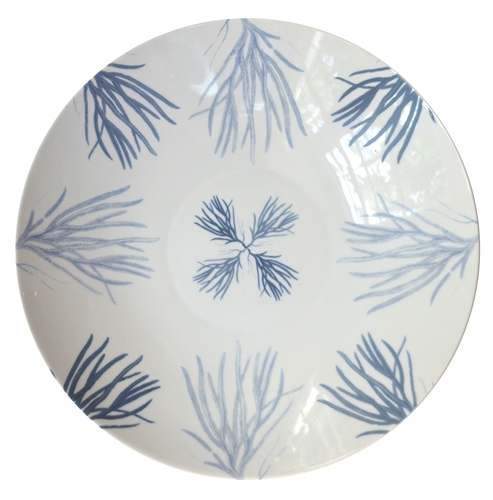 Pair this lovely bowl with our Flora Medium Serving Platter for a coordinated look.